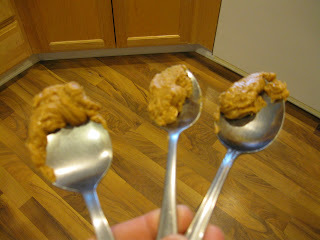 We decided this week while working with the Snuggle Puggle we would check out our peanut butter. The crazy old bat told us that we only use Skippy and it is suppose to be fine. We told her that she had better get some out so we could be the judges. It looks OK on those spoons, but only a taste will tell. We are all willing to put forth the sacrifice. ( Besides we know that Skippy is not tainted.) Yep, it seems to be fine. Are we clever or just sneaky? When Brice first came here, he didn't like PB. Can you believe that! Now he understand the joy than can be on a spoon. That looks delicious. Sure keeps you going for a while doesnt it hehehe. peanut butter is best! It looks like you and the rest of your pack had a pawsome time with the sticky stuff! Mom always laughs at me when I get some on my nose and try to lick it off. BOL! Our bedtime snack is Jif in a kong -- and we've never had the opportunity to do a taste test. Do you have any results??? Hey send me some skippy. Mom ordered this peanut butter powder that has less fat and it is no skippy. We don't know what is wrong with her. Nothing says khwality khontrol inspekhtion like a fine khanine tongue! I can sees you is hard at work there. It looks yummy! I love your little red bows Moco, that's so pretty. I am not sure if your test was scientific. Please forward all jars of peanut butter to my estate at once so that I can taste test them for you. The sounds of you guys licking that glorious peanut butter off the spoon is killing us! We love your pretty red bows, Moco! Moco, you must be going to a party; just look at those pretty red bows in your hair! I love it! Motch puts some in a kong for me every mornng before she leaves for work, and I don't even notice when she leaves. Now that's the kind of job we want to get. It was interesting to see each of you with your own unique way of testing that pb. You guys are so smart!!! I better go tell Mom we need to check our peanutbutter, too!! What a great job you all are doing.. You should get paid overtime for that..
My girl wonders if I've been eating peanut butter, because I do that ALL THE TIME! Oh, and Moco - you look FABULOUS, darling!!! Love you in red! I'd say sneaky, but Mom says clever! Great work y'all! I had some peanut butter the other day, its the best! You look adorable with your red bows! I can see your working tongues! oh moco. poor puppy has to wait to go last. what good manners! Mmm...peanut butter. But we like Jif! that looks like some serious peanut butter enjoyment going on there. we are sooooo hungry - starving - poor us - can we have some peanut butter too, mom????? we were very VERY SURPRISED today when the mail lady brought us a package from YOU! that made our day! there was some really good stuff in there and we LOVE IT. you were very sweet to pick out all of those wonderful treats and chews and glow stick and squeaky stuffy bone. our mom let us have the piggy slivers already, but she's making us wait for the rest. oh we are drooling. thank you so much. that was so very SWEET of you. we will post about it soon. Thank dog you are willing to be a sacrificial lamb (so to speak) and try that PB. You are a hero, but man do I want some of that right now! Oh good job! It was so nice of you to test the PB. I taste all of my ma ape's food, even the vegetables and fruitables. Wooo peanut butter. Sticks yummily to the tongue and the roof of the mouth! Yum yum! I think you guys are PAWSOME over there for checking the PB to see if it is safe for your family! The peanut butter look really tasty but I am never interested to taste it before. perhaps I should try it someday. I behave the same when I was given Manuka Honey too. My ma ape got the crazy compost idea after seeing Grammie's! She is hoping she can get a new house before planting time. I hope she grows maters. I DO love my maters! BOL! You three looked so funny! It sure is hard to get the peanut butter off on the top part of our mouths huh? Very sticky! Hi guys! Sure have missed you all. Looks like I've lots to catch up on. Ooh yummy...I love peanut butter too! I bet you all had to take lots of drinks of water after that yummy pb! Yum, that video made me hungry for some peanut butter! !